Employee Poaching is a process where a rival company decides to poach a certain employee from the competing company. This Poaching can be considered as a legal way of approaching an employee of the competing companies. There are several factors to consider while choosing an employee poaching option. Therefore, it is better to understand the elements of employee poaching before acting against such decisions. An employee even can present himself / herself considerable for poaching. When it comes to an employee who decides himself to be Poached from the rival company, then it is better to be fully prepared to make themselves Poachable employee. 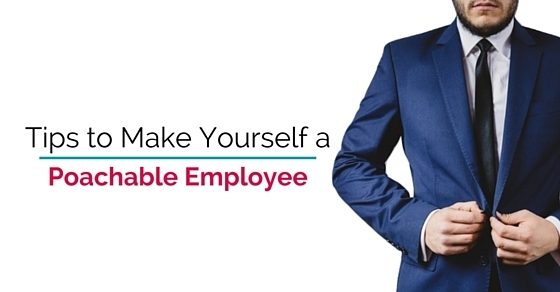 There are some of the ways to follow while making yourself a Poachable employee and they are as follows. When a rival company decides to Poach a certain employee of the competing company then that rival company needs to be sure of the employee they need to poach to their company. To make that possible an employee needs to start presenting his / her skills and abilities online through technical tools of social media to connect with different users of that media. By presenting all the skills and abilities of themselves, it is possible that rival company can be interested in Paoching you to their company. To make yourself a Poachable employee, the employee needs to follow all the networking events where he / she can find all the reputed company directors who will be interested in their Poachable skills and abilities. By attending such networking events an employee will get to know the real picture about the value of their skills and abilities in the similar job market. Sometimes it is even possible that an employee may be approached in such networking events for the better position and pay which can be beneficial for their professional growth. When an employee needs themselves to be poached from the other company then it is time to start building connections with the rival company of their existing company for whom they used to work. These processes of employee poaching can be tricky for the rival company and also for the employee who need themselves to be poached for the best position and payment for their professional growth. And finally these connections can make yourself a Poachable employee without any extra time. When a company decides to poach an employee from the competitor company then they need to be prepared with all the legal obligations they are supposed to face from the rival company. And similarly when an employee puts themselves out for employee poaching then he / she should be prepared with all the legal obligation that they would be approaching from their existing working company. Therefore, it is better to be fully prepared of all the legal obligations of employee poaching. When an employee decides that he / she need to be poached from the other company, then he / she should contact a well qualified advocate before making any silly mistake with their professional career and end up facing serious trouble. When an employee starts feeling that his / her skills and abilities are not paid well in the existing working company, then it is common to feel disappointed from the company and at that time they can start building networks for their own Poaching process. When an employee feels unsatisfied with the payment and working environment of his / her existing company then it is possible that he / she can start creating a list of job search tools, to look for some new job opportunities. And instead of ending in a company who doesn’t value one’s skills and abilities, it is better to switch themselves to the best opportunities. And these opportunities can be visible through some of the job search tools. While an employee, starts building his / her own employee poaching, it is better to be aware of all the legal terms of their own employee contract that they signed before joining a company. An employee needs to understand all the legal terms of their appointment contract letter, to check whether there is any kind of obligation specification that employee poaching is an unavoidable crime for the employees and as well as the rival company involved in such employee poaching. It is common to understand all the skills and abilities of the employee before deciding any kind of employee poaching process. These explorations of skills and abilities can turn things in a positive way for the employee who is willing to make themselves a Poachable employee. These employee poaching considers only the skills and abilities of the employee which can be beneficial for the rival company who are willing to start an employee poaching. When an employee decides to make themselves a Poachable employee, then that particular employee needs to present themselves as a brand value which used to be acquired by the other company. By presenting your brand value an employee can start activating one’s strategy of attracting rival companies to be interested in his / her brand value. Therefore, it is better to understand all the elements of employee Poaching before taking any kind of decision. Most of the time it is necessary to be informed of all the legal obligations of the employee Poaching. But when an employee makes himself / herself Poachable then it is clear that he/she is not willing to continue to work in the present company and that’s why he / she is thinking of making themselves Poachable. But there are some of the ways to make Poach resistant employee and they are as follows. Most of the employees of the company are interested in some offers or benefits by their company regarding their safety and security. In such cases when the company refuses to provide some basic safety and security needs for an employee of the company, then there is a possibility that an employee may start thinking about Poaching themselves to another company which can offer better benefits for their skills and abilities. It is possible that most of the employees who works in the office may end up feeling some kind of negligence from their company in terms of their working skills and abilities. At that time those employers need to make sure that they appreciate all the working environment of the employees who works for the overall growth of the company. All these small changes can make an employee Poach resistant. Employee Poaching is applicable to such employees who are not getting paid for the work they deliver in that particular company. Such unsatisfying environment can lead to employee Poaching without any delay. And to avoid all these, it is very much necessary for an employer to understand the needs and requirements of an employee expecting from their company and providing them such requirements will make a Poach resistant environment. When a well qualified employee makes a decision of joining one particular company he / she should keep a period based plan to make sure that they are provided with all the benefits which they are supposed to receive from the company which is equal to the skill and abilities that they are offering to that particular company. Therefore, such period based plan can create a structure of benefits to make sure that the employee can be Poach resistant from any kind of better beneficial outside offerings. To make such employees Poach resistant who is an asset to the company, an employer need to be prepared with a plan that is called promotion which can offer them all those benefits which are received from the rival company upon Poaching themselves to that rival company. And to avoid such awkward situation an employer keeps providing them promotions which they deserve in their working department. All these benefits can create a Poach resistant environment in the company which is beneficial for the overall development of the company. And the bottom line is that when an employee decides to put oneself to the other company so that his / her skills and abilities are valued better, then it is possible that an employee make themselves a Poachable employee to expect a better growth in their professional career. Therefore, all these above mentioned tips and ways are for those employees who want to make themselves a Poachable employee.